Before I became re-enamored with fantasy, I was an avid reader of historical fiction (or as I like to call it -- fantasy for people who don't want to be seen reading fantasy). I read Shogun (Clavell), Pride of Carthage (Durham), Musashi (Yoshikawa), Gates of Fire (Pressfield), and their ilk. It's exciting to me now when I come across a fantasy concoction that blends that historical sensibility with the speculative. Anne Lyle's debut novel is just that kind of brew. Set in historical Elizabethan England, Alchemist of Souls shows what might have happened if the Virgin Queen had children, secured her rule, and made an alliance with a heretofore undiscovered alien race from the New World. Lyle's protagonist is Mal Catlyn, a down on his luck swordsman with a checkered past and an unfortunate family connection to Catholicism. The skraylings, a new race from the New World, have been allied with England for a generation, but an ambassador had yet to treat with the Queen. With word of the first skrayling delegation, Mal is hand picked, rather unexpectedly, to serve as bodyguard during the controversial visit. Assassination attempts are the least of his concern as layers of espionage and political jockeying begin to pull him in unexpected directions. Along with the intrigue, Lyle sets the stage with a tournament of stage performances in honor of the ambassador's visit. Put on by the three most esteemed theater troops in London, the tournament becomes a set piece for the larger story. The theater sections are told mostly through the eyes of Coby, a young woman hiding behind men's clothing, and connects to Mal's thread through his friend Ned, a scribe with a penchant for theater men. Between the three of them they'll be asked to prevent a conspiracy at the core of the monarchy. There's one requirement in a historical novel and that's tone. Accuracy is important. I certainly don't want auto-loading revolvers running around 16th century London, but it's secondary to capturing the tone of the time. For Elizabethan London that means a lot of things -- religious tension, theater, foreign conflict, and the economic expansion from the New World, to name a few. While some modern affectations of character and language assert themselves from time to time, Alchemist embraces that historical tone from the opening pages and left me wondering whether I was reading a fantasy at all. References to the recent death of Christopher Marlowe, a tense tennis match, and the dropping of Bloody Mary's name all lend themselves to setting an ambiance that's decidedly Elizabethan. Brought into this authentic setting are the skraylings, a 'race' that I was surprised to learn was, at least tangentially, pulled from Norse history. Encountered in the 11th century, the skraeyling were a people of the region known as Vinland (maybe Newfoundland? ), about whom almost nothing else is known. In Alchemist the skraylings are far more fleshed out, exhibiting an entirely different evolutionary line than humanity. Part Native American, part alien, part alchemist wizard things, they exist as Lyle's fantastic element and the impetus by which the narrative moves, woven into Mal's childhood and hopelessly intertwined with his future. Taking things to another level, Lyle adds characters who exist in the historical space. Mal struggles with his familial responsibilities and his duty to the crown. Coby fights her lie and her faith. Ned reconciles his lifestyle to a world that rejects it. These values they struggle with and embrace in equal parts are so tied to the time in which Lyle has chosen to write that they could not have existed else wise. Overall the Alchemist has great pace, moving through equal parts political intrigue, bursts of action, and fear of discovery for Coby and Ned. There are moments where Lyle jumps forward in a plot line too suddenly, making a supposition or connection that a character don't seem quite ready to make. Likewise, I raised an eyebrow or two at the social progressiveness of many of the characters who for the time are significantly more accepting of others than I might expect. These are minor complaints and seem reasonable solutions to difficult problems, most notably the fact that close minded bigotry isn't a lot of fun for a socially progressive audience. 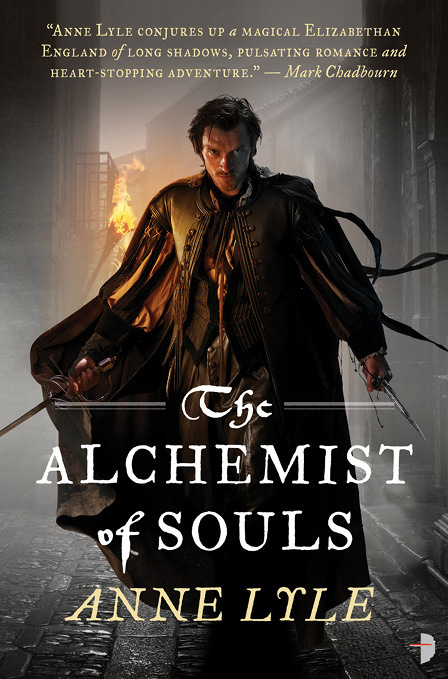 Mysterious circumstances combined with historical authenticity and the strange, Anne Lyle's Alchemist of Souls is a 2012 debut I can strongly recommend. It will stand out in the Angry Robot catalog as a title with broad appeal across a wide swathe of genre readers, as well as a real departure from many of their titles that eschew genre classification. Sounds like a pretty cool book. Adding yet another book to my to read list. Thanks for the review. My fear for this novel is that its going to get the same treatment that poor Patricia Wrede did a couple of years ago with The Thirteenth Child, where she didn't have any Native Americans in the Americas at all...and a certain segment of fandom pronounced it "Racefail". I can unfortunately see the nonsense and blather now, and hope that Lyle doesn't fall victim to it. Good comment. Although I didn't mention the Indians, Lyle certainly does.